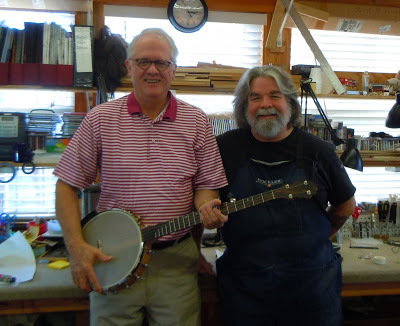 Lee Thomas, shown above with Chuck, came over last week to help us out for a magazine photo shoot. 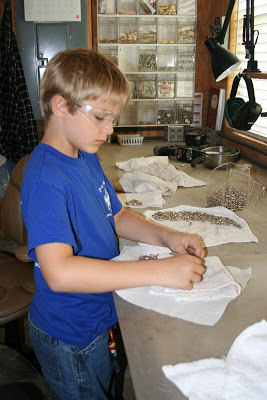 While he was here, he tried out the prototype of our new Cottonwood Model! This one is a Vintage, and like all future Cottonwoods, has a Dobson tone ring. For this neck Chuck chose select curly walnut, and a walnut rim. What does the Cottonwood sound like? It sounds great! It looks pretty cool, too! This very Cottonwood is scheduled to be in the hands of Zepp Country Music today. 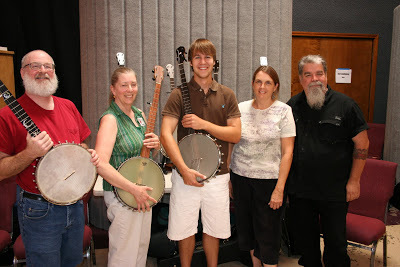 Lee is a wonderful banjo player, and he, his wife and son, are all part of the talented and friendly Old-time band, Salt Rock Rounders,of Fort Worth. Lee is also our consulting attorney and doesn’t even mind lawyer jokes! If he looks familiar, you may have seen him featured in the Chuck Lee Banjo episode of Texas Country Reporter. 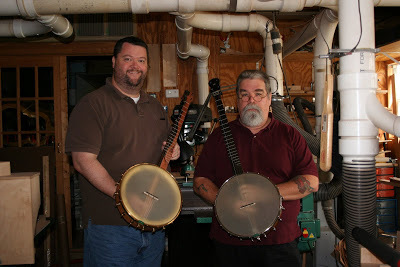 Lee is pretty handy himself with Banjo assembly and setup, and owns 3 Chuck Lee banjos. (He tells me his favorite is his Custom A-scale with wood tone ring).